Editor's Note: This story first appeared in the 2018 Spring/Summer Arbor Light magazine, a biannual publication of Concordia University Ann Arbor. Catch the newest edition dropping in mailboxes at the end of April. For your free subscription of Arbor Light, email arborlight@cuaa.edu. 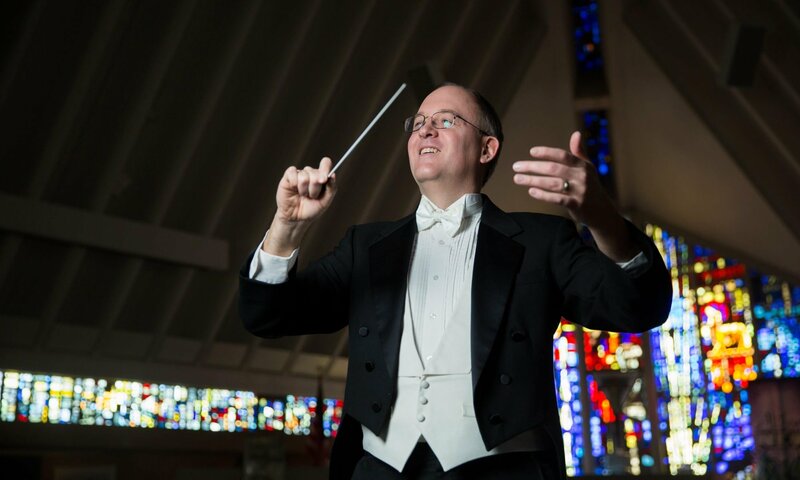 No Easter service is complete without a rousing rendition of “Jesus Christ is Risen Today,” or so says Concordia University Ann Arbor Music Department Chair Dr. William Perrine, who counts the tune among his favorite hymns. Not surprisingly, the melody can be heard within the latest CUAA-commissioned band composition, “Green Blade Rising,” which the CUAA Wind Ensemble premiered on Easter Sunday. The band received a prestigious invite to be the showcase performance group of the 2018 Chicago International Music Festival, claiming the opportunity to perform at the Symphony Center in Chicago, one of the nation’s most renowned music venues. 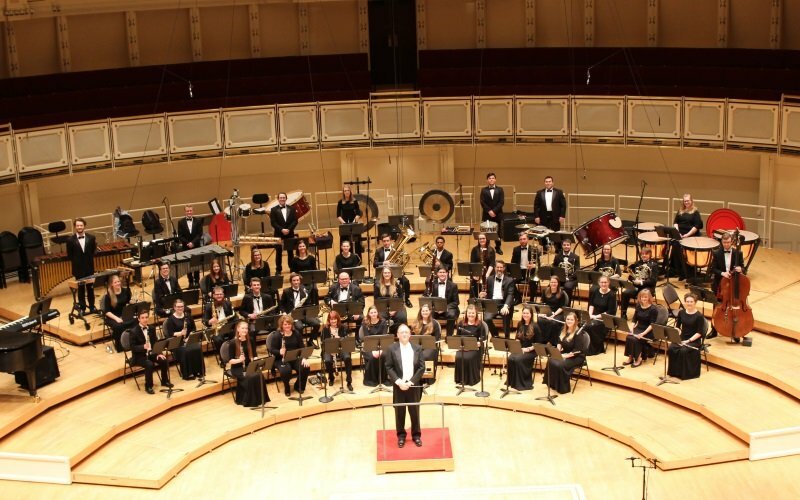 CUAA Wind Ensembles participated in the prestigious 2018 Chicago International Music Festival on Easter Sunday, April 1. The performance date afforded a not-to-be-missed chance to bear Christian witness to all those who attended the concert, says Perrine. However, as he prepared for the event he was reminded of just how few Easter band compositions there are in existence. Perrine, likewise, was interested in creating a piece to highlight the significant achievement of CUAA’s music department and to celebrate for years to come the gift of Christ’s defeat over death. Last fall, Perrine commissioned Dr. Geoffrey Stanton, who serves as an adjunct instructor for Concordia, to compose the piece. Stanton has received numerous composition awards, fellowships, and commissions throughout his career, including from the National Endowment for the Arts. The result of Stanton’s effort on Concordia’s behalf is a moving repertoire of melodic lines, beautiful harmonic implications, and rhythmic appeal. Stanton utilized Easter hymns and carols, including “Lyra Davidica” (“Jesus Christ is Risen Today”), “Victory” (“The Strife is O’er”), and “Noël Nouvelet”/“French Carol” (“Now the Green Blade Riseth”). It’s the second piece that Perrine has had commissioned this academic year. Last fall, in honor of the 500th anniversary of the Reformation, the CUAA band premiered “Luther: In Canon,” which features the tune “A Mighty Fortress is our God” interwoven with other Reformation-era classics. Perrine secured world-renowned composer James Stephenson for that piece. The two original scores mark a new direction for Concordia. This is the first time in recent history that the CUAA music department has led the commissioning of music, and Perrine says he plans to continue the practice in the future. Learn more about CUAA’s music offerings at cuaa.edu/music.